This page features a brief narrative of the Republican River Compact’s history and key events. Highlights: Basin description, Compact overview, basin development, 1998 lawsuit and Final Settlement Stipulation, and recent RRCA agreements. Republican River Basin Description The Republican River basin begins in the plains of Eastern Colorado. The river then flows through Northwest Kansas and Southwest Nebraska and after traversing a large part of Southern Nebraska, finally returns to Kansas and empties into Milford Reservoir. Releases from Milford Reservoir join the Smoky Hill River to form the Kansas River at Junction City. The Republican River basin and associated sub-basins across the states of Colorado, Kansas and Nebraska. Following the drought of the 1930’s and a devastating flood in the basin in 1935, the Republican River Compact (1943) was negotiated during the early 1940s to pave the way for a system of federal dams and irrigation districts. The Compact was ratified by the states of Colorado, Kansas and Nebraska and federally in 1943. Principally, the Compact provided an apportionment of the basin’s water supply between the three states. To accomplish this, the negotiators of the compact determined the virgin water supply (the water supply within the basin un-depleted by the activities of man ) within the basin by major tributary (sub-basin) and allocated those supplies based on anticipated development. The compact includes provisions for adjustments to the virgin water supply and allocations based on future records and/or changing conditions. With the ratification of the Compact, the Bureau of Reclamation and Corps of Engineers began developing their proposed projects in the basin. The federal projects in place today include a system of seven Bureau of Reclamation reservoirs, two Corps of Engineers’ reservoirs and six irrigation districts. In 1959, the Republican River Compact Administration was created to: (1) provide for equitable division of such waters; (2) remove all causes of controversy; (3) promote interstate comity; (4) promote joint action by the states and the United States in the efficient use of water and the control of destructive floods; and (5) provide for the most efficient use of waters in the Republican River basin. Significant groundwater development has occurred in the basin after the federal projects were in place. This groundwater development was at the heart of the controversy between the states of Kansas and Nebraska over recent decades. Kansas alleged that Nebraska’s significant groundwater use, combined with its surface water use, placed Nebraska over its compact allocation in many years. 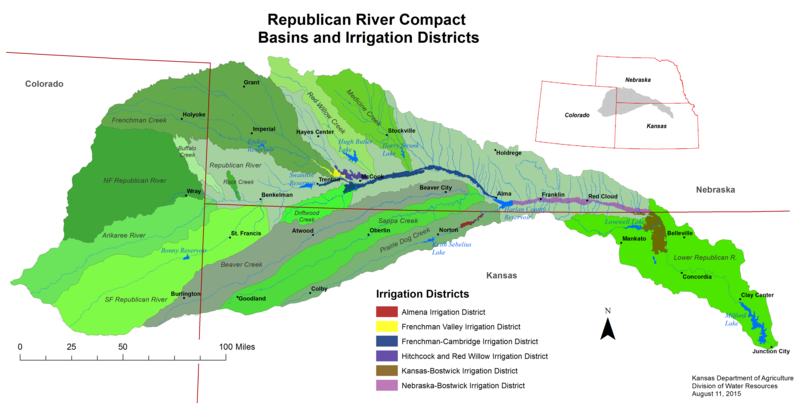 In 1998, after failed attempts to resolve concerns over increased groundwater development in Nebraska’s Republican River basin, Kansas filed suit in the U.S. Supreme Court to enforce the terms of the compact. That case was settled December 15, 2002, when the final settlement stipulation was signed by the member states with the consent of the federal government. The Final Settlement Stipulation (FSS) defines how compliance with the Compact’s requirements will be determined including detailed accounting procedures and the use of a jointly-developed groundwater model. In the dry period of 2003-2006, Nebraska overused its Compact-allotted share of the Republican River and Kansas water users were harmed. In 2010, Kansas again filed suit in the U.S. Supreme Court. In 2015, the Supreme Court found that Nebraska had violated the Compact and required it to pay Kansas $5.5 Million in damages for Nebraska’s overuse in 2005-2006 (Supreme Court Decision Jan 2015). However, the Court refused to grant Kansas’ requested remedy, allowing Nebraska to choose its means of achieving compliance. After Kansas’s 2010 filing, Nebraska took additional actions to achieve compliance including developing two augmentation projects to enhance flows in the River to offset its overuse. Colorado also developed an augmentation project during this period to offset its overuse. Beginning the summer of 2014, the three states entered into a period of monthly discussions seeking to reach agreements that would provide appropriate credit in the Compact accounting for Colorado’s and Nebraska’s compliance activities while providing Kansas users the water they are entitled to in a way that maximizes its usefulness and minimizes waste. The States’ efforts resulted in a series of six interim agreements from 2014 to early 2016. The success of those agreements and the experience that the States gained from them led to two long-term agreements approved at the 2016 annual meeting of the Republican River Compact Administration: one agreement focused on Colorado’s augmentation project (the Colorado Compliance Pipeline or CCP), and the second agreement on Nebraska’s two-augmentation projects, Rock Creek and the Nebraska Cooperative Republican Platte Enhancement (N-CORPE). Click here to view the agreements on the Reference Material page. At a special meeting held May 25, 2017, the RRCA adopted revised accounting procedures to implement the 2016 long-term agreement and approved accountings for the years 2007-2015. Click here to find the resolution and accounting procedure documents. On February 22, 2018, Nebraska and Colorado entered into a negotiated Settlement of claims regarding Colorado’s past use of water under the Republican River Compact. On August 3, 2018, Kansas and Colorado entered into a negotiated Settlement of claims regarding Colorado’s past use of water under the Republican River Compact.